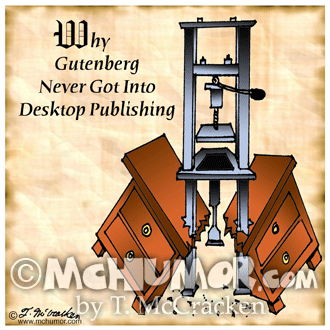 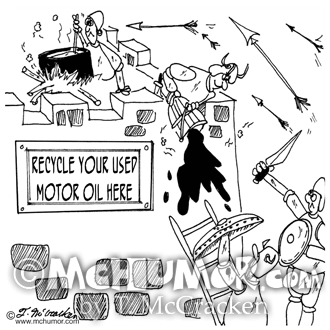 Recycling Cartoon 6738: A medieval castle where they are pouring boiling oil on invaders is a sign, "Recycle Your Used Motor Oil Here." 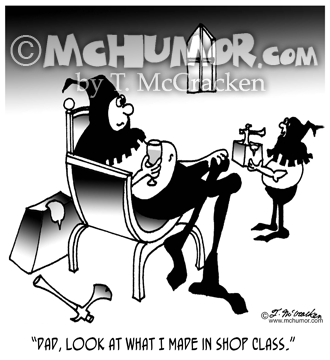 Shop Class Cartoon 3795: Hooded executioner's son holding a smaller version of his chopping box and axe saying, "Dad, look at what I made in shop class." 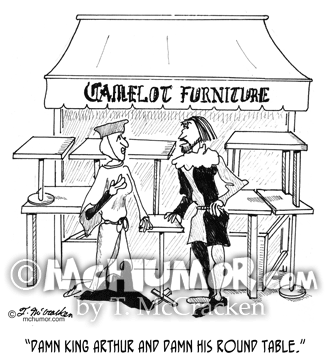 Grant Cartoon 5194: "If Robin Hood Were Giving to the Poor Today." 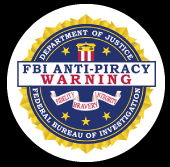 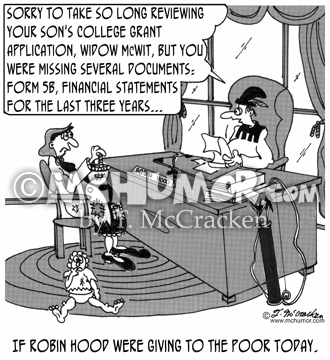 Robin, holding a form says to a woman, "Sorry to take so long reviewing your grant application, Widow Cranz, but you were missing several documents: Form 5B, Financial statements for the last three years." 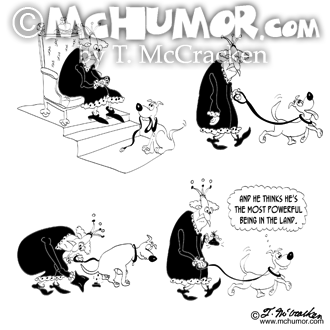 Dog Cartoon 9005: A dog with a leash in its mouth sits before a king on a throne, the king walks the dog, the dog poops, the king grimaces as he stoops to scoop it up, the king holds a steaming bag while the dog thinks, "And he thinks he's the most powerful being in the land." 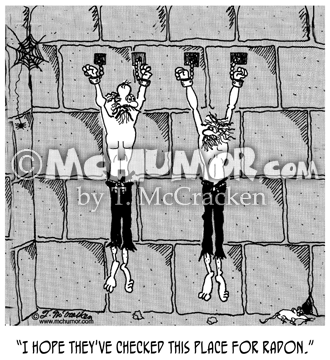 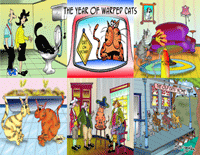 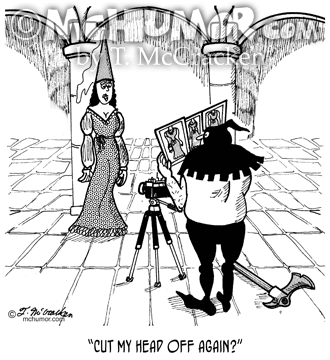 Environment Cartoon 4994: Man hanging in dungeon saying to cellmate, "I hope they've checked this place for radon." 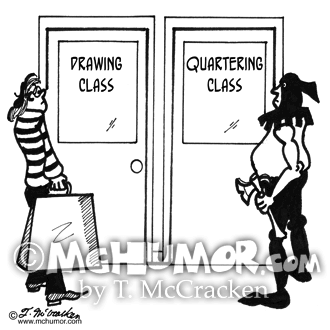 Drawing Cartoon 2321: An artist stands in front of a door saying, "Drawing Class" and a medieval executioner stands in front of a another that says, "Quartering Class." 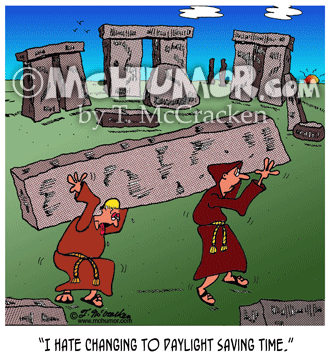 Daylight Saving Time Cartoon 9060: A Druid monk moving a humongous stone at Stone Henge saying to another: "I hate changing to Daylight Saving Time."